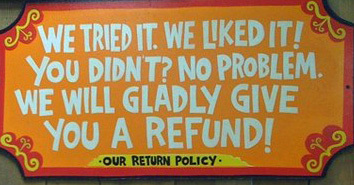 Trader Joe’s is great about returns. Their policy? If you aren’t satisfied with your purchase – for any reason – they’ll give you a refund, no questions asked. Even without a receipt, you can often return or exchange TJ’s items. Simply take the item(s) in question to your local Trader Joe’s, and tell the help desk that you want to return them.